These are paper shape cut out exercises in a book that I am currently studying. "Finding Your Own Visual Language" , a practical guide to design & composition by Jane Dunnewold, Claire Benn & Leslie Morgan. 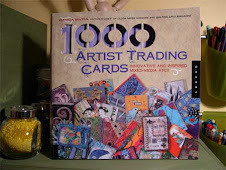 I highly recommend it if you are an artist who wants to move forward, dig deeper and create more art. My paper shapes started as a square, rectangle and leaf shape. I then cut and expanded them, still trying to maintain the general shape. I will expand, shrink and combine them to use in my quilts. My quilt, "Taffy Cat" is now at the Breaking Traditions exhibit in Novi, Michigan. If you click here, you can see a close up of him and read my statement. The online catalogue is here. There are some amazing quilts in this exhibit which benefits the American Cancer Society. Click on each one to read their statements. The theme for 2008 was "With One Voice". Just wanted you to know that I have been busy. I have been in the creative process...sketching, planning, etc. 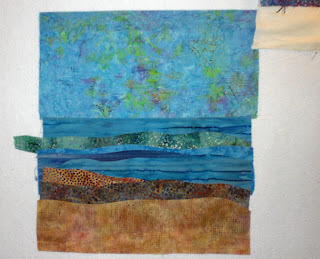 This one is an ocean scene that I am currently machine quilting. I'm sure it will have embellishments...yarns, beads and shells before I'm finished with it. 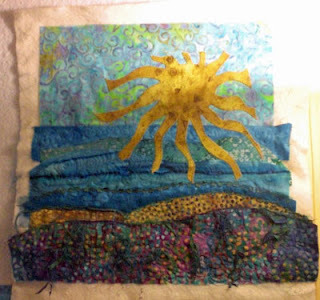 The two below are on my design wall waiting for a few more pieces to be added and then I will quilt them. It all started with the one below ...the one with the sun. We had a challenge in my Art Theory group to use a lunch bag full of goodies (embellishments) in a quilt. There were yarns, ribbons, candy wrappers, beads, gold threads, wire, paper, etc. I put it all in a dish and painted it ocean colors, of course! I still have most of the bag of embellishments left that I have to put on the quilt. It will have a center in the sun that is made of tulle holding the shiny beads, ribbons, etc. I couched some of the ribbons in the waves. This will definitely be a whimsical, fun quilt. While making the background to this one, I cut backgrounds until I had several ready to make into quilts...a new series. It was truly improvisational. I usually use one of my photographs and sketch out the design. I found this method really fun. I hope to do more like this. 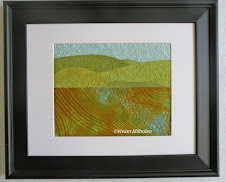 I did use Liqui-Thread on the edges (liquid fusible) which I applied with a brush. 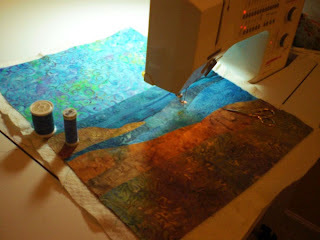 I really like that stuff for raw edge applique. I hope to finish these soon and I'll post the results. We went to Ohio over the Labor Day weekend. Here are some pictures below. Emma was soooo tired after a wonderful weekend of hard dog play with Maya & Barley that she slept all the way home and most of the next day! We had a great time visiting them. 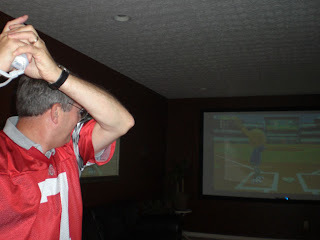 Vern playing baseball the easy way...Wii. We went to the Greek Festival and had yummy food and enjoyed the colorful festivities. 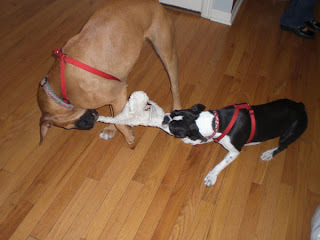 Emma had someone (Maya) to play tug-o-war with her. 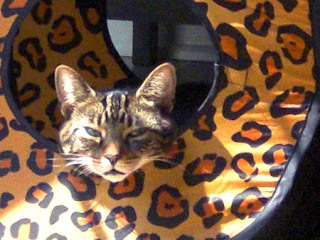 Taylor in her "cat house"